The actor surprised everyone — and it's all thanks to his mom. After years of "Hey, girl," memes, it may seem difficult to grab the attention of actor Ryan Gosling on social media. But a hilarious campaign by a tenacious coffee shop owner in Toronto prompted the Canadian star to make a surprise visit on Tuesday — and it's all thanks to Gosling's mom. It all started on Sept. 1, when Joelle Murray, owner of Grinder Coffee in East Toronto, began to post photos of a life-size cardboard cutout of Gosling holding a coffee cup with the shop's name. Then the city's mayor stopped by to pose with the cutout and the campaign really took off. Murray continued to post photos of the cardboard image of Gosling every day. Although the cutout did not include Gosling's legs, it was detailed enough to take him on a series of crazy Canadian adventures. Murray joked with TODAY Food that she brought the cutout to the mall, got him a massage and a haircut. She also sent Gosling a Google map of where the café was located. 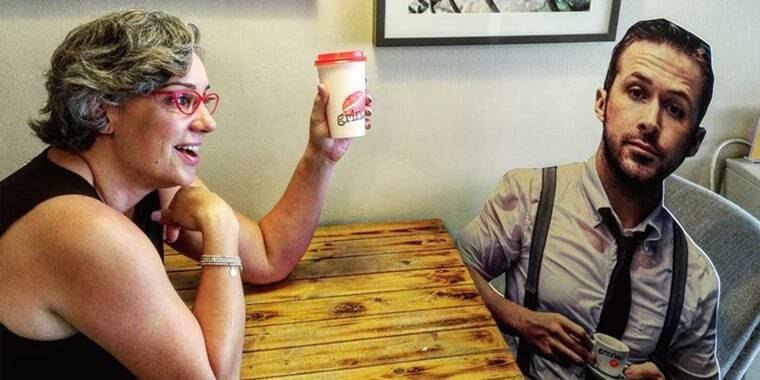 In 2017, the café unsuccessfully tried to lure in actor Idris Elba with a similar campaign using a home-printed cutout of his face and the hashtag #IdrisNeedsGrinder. It didn't work.